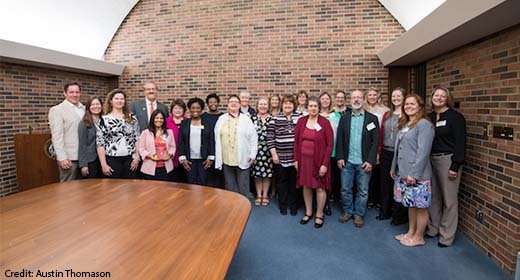 On May 7, President Mark Schlissel awarded the 2018 President’s Staff Innovation Award to the MSTAFF200 Planning Lead Team, which included the Ford School’s Sharon Disney and Beth Soboleski. Individual and team winners are selected each year, recognizing staff members across campus who “contribute to excellence on many levels,” said President Schlissel when presenting the awards. The President’s Staff Innovation Awards represents university staff’s big ideas that are “outside The Cube” to help make campus a better, more inclusive community. The team that Disney and Soboleski were part of was responsible for planning, designing, and implementing MSTAFF200, the bicentennial event celebrating 200 years of staff contributions to the university. As The University Record writes, “The team managed more than 600 volunteers to successfully celebrate tens of thousands of staff who have helped make U-M a world class university.” Congratulations, Sharon and Beth!